Many of us would love to be able to paint a painting that looks as if a real painter created it. But, lets be honest here, not many of us have the know-how to be able to do such a thing. As very young children we enjoyed filling in the pictures in our coloring books. What if someone created a more sophisticated form of coloring book for us, now that we are older. Well, they have. 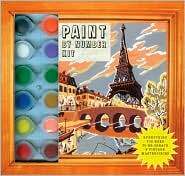 In 1948 Dan Robbins invented the first paint by numbers kit for the Palmer Paint company. It was a kit which was targeted for an adult audience so that adults could create paintings that suited their tastes (landscapes, seascapes, flowers, sunsets and the like) by filling in numbered spaces with the appropriate colors. Now you can try this highly popular craft for yourself with this very special kit. The kit includes an informative and helpful booklet, eight vintage style paint by number "masterpieces" to paint, twelve pots of acrylic paint, a paintbrush, and eight little board easels. The booklet not only tells you the story of the paint by numbers movement, but it also provides you with helpful tips on how to complete the painting projects. It also includes color pictures of the completed paintings so you can see what they look like. There are some who are critical of this craft, but it can be a lot of fun and very relaxing to do, and one ends up with a pretty painting at the end of it. So if you feel inclined to paint a picture of the Eiffel Tower, of a vase of poppies, or of a serene fall scene, and want a guaranteed outcome, then this is the kit for you. The kit has been carefully designed to be fun and entertaining, and it would make a great gift for someone who likes to try new "crafty" projects and who has an interest in the history of popular pastimes.